This is my standard method of germinating seeds. Dampen a paper towel and place the seeds between the folds. These sprouted in three days (depends upon the seeds), in the dark, and temperature ~72F. Immediately after emerging from the soil place in bright light. For the initial growing a LED lamp is used with a five gallon pail. Sunlight is used when available. 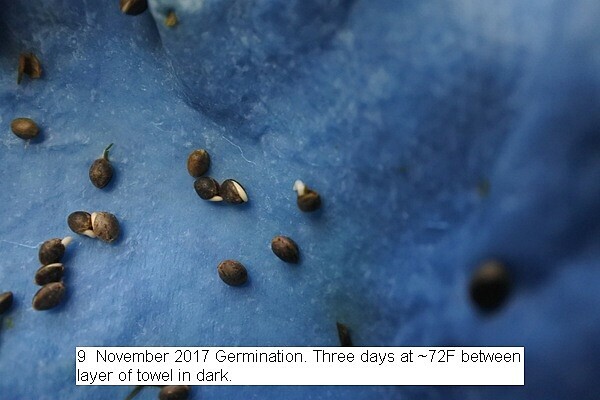 This entry was posted in Uncategorized and tagged 9 November 2017 Germination (Method), Germination. Bookmark the permalink.